So we need more indie bookstores, right? And the ones that exist need to learn how to be dynamic and innovative in order to survive and thrive. Whatcha gonna do about it? The Emerging Leaders Project recognizes the need to deliberately retain, develop and support the industry's future innovators and leaders. Emerging Leaders Conversations are set up for peer networking and discussion of topics that relate to the future of bookselling, leadership development and industry education. The Emerging Leaders Project is tailored, but not restricted, to people forty and under, who plan on sticking with the industry for the next twenty years and demonstrate a passion for bookselling. This project isn't unique to bookselling: do a Google search for "emerging leaders" and you'll come up with a lengthy list of similar programs in all kinds of industries and institutions. The founders of this project took some of their inspiration from the mentoring programs of Americans for the Arts, which faces similar issues in the fine arts (competition from new media, aging audiences, etc.). The Project is partially supported by the American Booksellers Association, but not run by or subject to the ABA board. The Conversations are the primary form the Emerging Leaders Project has taken so far. The first one was at the ABA Winter Institute in Long Beach, which I missed; from what I hear, there was a lot of excitement, but not a lot of practical discussion after the introductions were completed. Another conversation took place at the BookExpo, and the leaders of the project had clearly learned from the last time. Two of my bookstore coworkers and I were there, and it was probably the most engaging and interesting and potentially revolutionary thing I did all weekend. To avoid reinventing the wheel, I'll describe what happened with selections from the recap email sent to everyone on the Emerging Leaders email list. The BEA Emerging Leaders Cocktail Conversation was held on Wed. May 18 at the ABA Doubletree Hotel in Crystal City. The venue, beverages and refreshments were provided by the ABA. 1. What can the ABA do to support the next generation? 2. What does a future bookstore look like? 3. 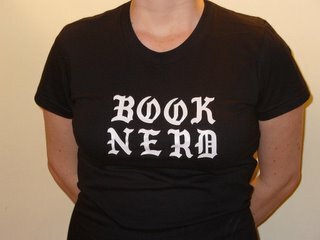 How do we making reading cool? Out of these discussions these ideas were presented. 1. A need for an on-line list serve or forum, a place for problem solving with other emerging leaders. 2. Staff exchange training programs between independent bookstores. 3. Mentoring opportunities – pairing seasoned booksellers with emerging leaders for a day at BEA or at a Regional Conference. 4. Sharing of information of how some bookstores have successfully motivated young staff to stay in the industry. 7. Business Classes – how to read a financial statement, developing relationships with schools, methods of outreach, web saviness. How to prepare a business plan. How to buy an existing store. 8. Can the ABA partner with "hipper" publications rather than just the "big" guys? Can they partner with media outlets? 9. Have Attorneys and Business people serve as resources for emerging leaders. 10. Give incentives for independent bookstores to send their younger employees to regionals and BEA. 11. A training – BEA 101—What do first timers need to know. For the future: Most every regional is planning an emerging leaders cocktail conversation for their fall conferences. Some are working toward creating a scholarship for emerging leaders. It seems that the regional conferences will best serve the emerging leaders programs, as an emerging leader is more likely to attend a Regional Conference. Going Forward:The four of us* will continue to communicate with the ABA and Publishers about creating additional scholarships, working on a moderated list-serve, a day of programming specifically geared for Emerging Leaders, and eventually creating an emerging leaders council. * The four booksellers who founded the project and currently comprise its leadership: Julia Cowlishaw of Shaman Drum Bookshop in Ann Arbor, Michigan; Cindy Dach of Changing Hands Bookstore in Tempe, Arizona; Neil Strandberg of Tattered Cover Bookstore in Denver, and Allison Hill of Vroman's in Pasadena, California. Obviously, this project is in its infancy: none of the ideas we presented are reality yet, and it may take a very long time to implement them. For now, it's just talk. But what talk! You can't imagine how incendiary it was to sit at one of those tables, surrounded by people my own age with the same passion for our life's work, hearing the creative and practical and ambitious ideas everyone was throwing out, helping to adapt and improve those ideas together. Just the fact of having a network of one's peers is a powerful tool at the disposal of the next generation of booksellers, serving to give us hope and confidence and provide us with others to ask questions of and work with in making the future . Hopefully a listserve and an Emerging Leaders website will be a reality soon, and the potential of the project will start to take shape. In the meantime, I agree with the conclusion in the final paragraph of that email: the current action for Emerging Leaders is on the local level. Regional bookselling associations are one way; I've already blogged about the great meeting NAIBA sponsored for Emerging Leaders in Phoenixville, PA, and how useful it was for everyone. And here in New York, we're making it happen too. Although I love the fact that the leadership of EL comes from entirely outside the supposed geographical nexus of literary power, the fact that so many publishing houses are located in New York means that we as NYC booksellers have a unique chance to connect with the Emerging Leaders on the other side of the industry. To that end, Richard Nash, the awesome publisher of Brooklyn independent publisher Soft Skull Press, and I are setting up a meeting for young "lifers" from all branches of the book industry: booksellers, editors (and editorial assistants), publicists, sales reps, writers, entepreneurs, etc. We're gonna get everyone together in a bar in Brooklyn and see what happens. Most of what happens will probably be just talk. But this is how a community gets built. This is how the future happens. If you want to know more about the Emerging Leaders Project, you can send an email to emleaders, at gmail.com. You can also check out the articles about them on the ABA website, here and here. If you're going to be in the New York area on June 20 and you'd like to be a part of this newest incarnation of the Emerging Leaders Conversation, send me an email and I'll send you the information about the event. I'll definitely be writing about it here afterward. I can't wait to see what happens.